I start each spring watching and anticipating each new bloom, watching the succession of daffodils and hellebore blooming to the burst of the foliage on trees. Now that I am surrounded by blooms and fresh greens, taking the time to walk the gardens each week and cutting blooms allows me to pause and appreciate the ever evolving selection. Right now we still have a few daffodils and hellebore hanging on, the allium are just starting to open and the peony heads are ballooning larger each day. One of the hellebore plants is now completely covered over by a hosta, so I clipped as many blooms I could to make the focal point of the arrangement. Everything else is a collection of items bloom in the gardens and on the perennial pads waiting to be planted in a client’s garden. I wish I could include the roses, they were absolutely beautiful. Maybe next week. You can tell from my collection below, I don’t focus on editing. 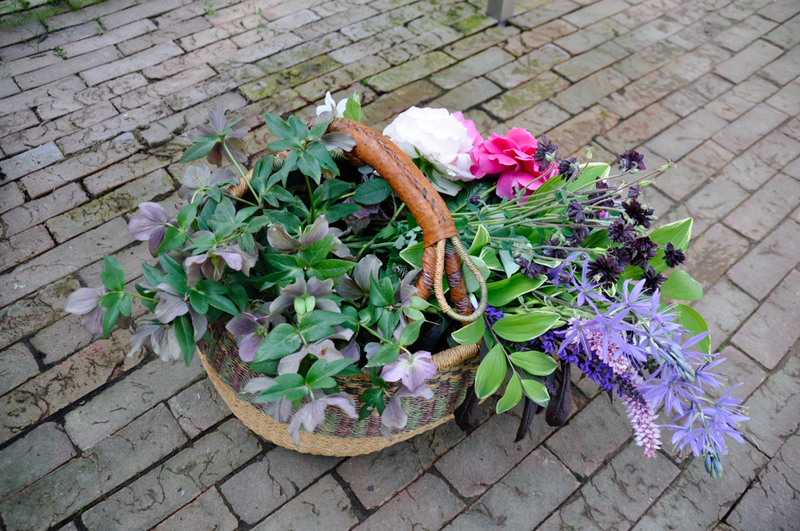 I try to get as many different varieties gathered together, much like I cut blooms within a specific perennial border to bring inside. My arrangement below includes seven different plants. 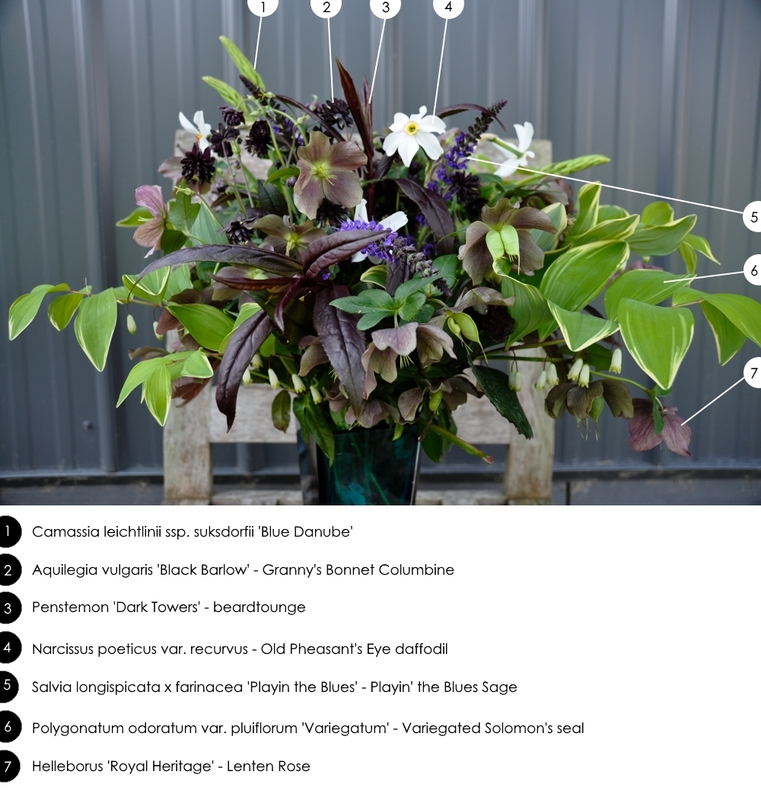 The blooms collected this week are listed below and included in the image below for quick reference. If you have any questions about a specific plant, let me know. Our gardens are in a zone 6a for reference. 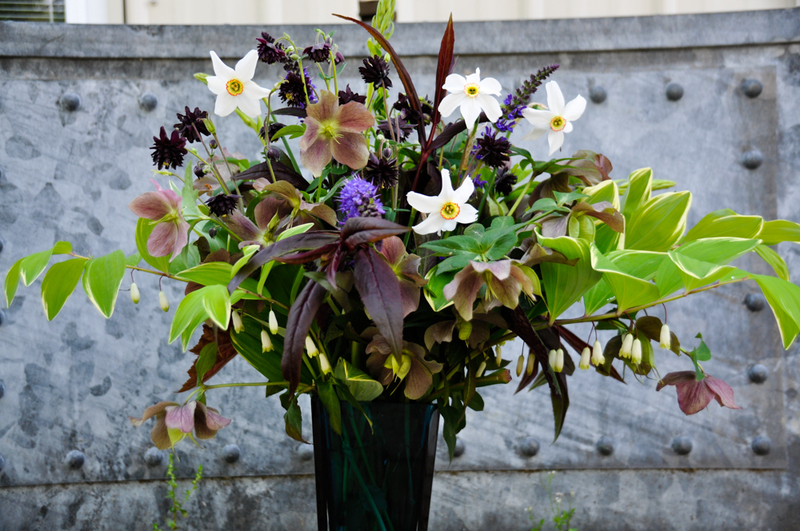 This entry was posted in Arrangement of the Week and tagged Aquilegia vulgaris 'Black Barlow', beardtounge, Blue Danube camass, Camassia leichtinni ssp. suksdorfii 'Blue Danube', central ohio, Columbus, fresh flowers, garden design, garden inspiration, gardening, Granny's Bonnet Columbine, Helleborus "Royal Heritage', In Bloom, Lenten Rose, Narcissus poeticus var. recurvus, Ohio, Old Pheasant's Eye daffodil, Penstemon 'Dark Towers', perennials, Plant Combos, Polygonatum odoratum var. pluiflorum 'Variegatum', Salvia longispicata x farinacea 'Playin the Blues', Variegated Solomon's seal by Nick. Bookmark the permalink.